This time of year I love food. Ok, it's true...I love food all year but this is when it really gets exciting to be someone who loves to cook or bake with fresh, local produce. But this also makes it an extremely busy time as I am harvesting this bounty, freezing berries, harvesting garlic, checking on the garden twice a day and sometimes staying up until midnight making the perfect jam. This time of year I get so caught up in fresh produce that I sometimes forget to make their favourite cookies or one of their favourite loaves. They complain a little but I don't feel too sorry for them as plum juice drips down their chin. I also know that I miss having a treat to stash into their bags as we head to the beach or park. But I just cannot bear to be in the kitchen more than I need to during the day when these days are hot. My friend's son was recently doing some baking and shared some of his Blondies with us. 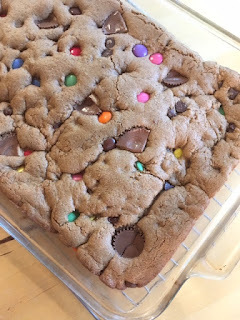 It was a bit of a revelation that you would basically bake a cookie dough into a 9 X 13" pan and save all the time of portioning out little bits of dough for cookies and waiting to rotate trays in and out of the oven. After talking to him, I found a recipe that was very similar in one of my Cook's Illustrated magazines. So, here is a super simple recipe that you can easily make in 5 minutes, toss in the oven and have to take to the beach later! Not to mention the fact that they taste great with the berries of the season! You can make these your own by adding up to 1/2 cup of "add-ins"- chopped nuts, some additional white chocolate chips, or even top with leftover halloween candy! Do not overbake these! 3. In one large bowl, whisk together melted butter and brown sugar. Add eggs and vanilla and whisk until well combined. 5. Bake until top is shiny and light golden brown, 23- 25 minutes. Do not over bake. Cool to room temperature. Cut into squares. Store in fridge if they survive longer than a day on the counter! Note: Recipe adapted Nov. 2016 to be made in one bowl!